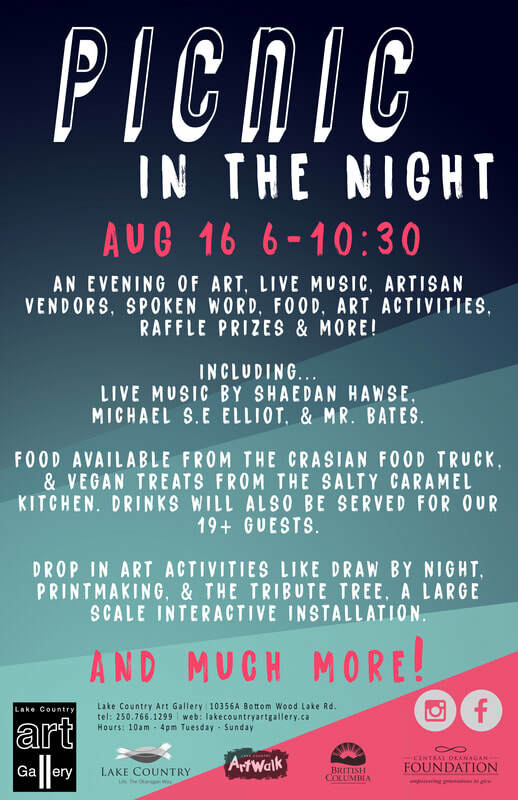 A night filled with art, artisan vendors, food, live music, spoken word, raffle prizes, an outdoor art gallery, art activities, and more! Picnic in the Night aims to bring together people from all over the Okanagan to hangout and enjoy art, music, food, and more in a comfortable environment. This outdoor event brings together various artists from various practices together for one eventful night to celebrate the end of summer. Food will be available from the Crasian Food Truck, with vegan treats from The Salty Caramel Kitchen. Soft drinks will be free while drinks for 19+ individuals will also be available for purchase. Musical guests includes Shaedan Hawse, Michael S.E Elliot, and MR. BATES. While spoken word will be performed by Peter Navratil, Sari Dale, Trophy Ewila and more! Various drop in activities will also be available, including Draw By Night, a simple printmaking project, and a large scale interactive installation called the Tribute Tree. Everyone is invited to create a tribute to someone in ones life to decorate the tree creating one large art piece that our musicians and poets will perform under. There will also be tons of art! We will have various vendors selling artwork and other artisan goods as well as an outdoor gallery exhibiting contemporary artists from the community. Make sure to bring cash to buy some of the great art that will be sold!